We love this and have been making it often. Preheat the oven to 400°F. Chop the cauliflower into small florets. Peel and core the pineapple, then chop into 1 1/4-inch chunks. Put the cauliflower and pineapple chunks on a sheet pan. Add 1 tablespoon oil, fennel seeds, mustard seeds, a pinch of salt, and black pepper. Toss together and roast for 30 minutes. 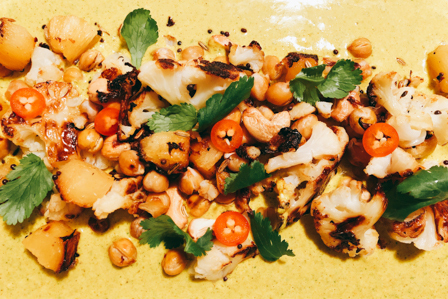 Turn everything over then add chickpeas and cook for another 10 minutes, or until the cauliflower is charred a bit. Meanwhile, toast the turmeric and curry powder in a dry pan on a low heat for a couple of minutes, or until smelling incredible, then put into a blender with the cilantro. Add ginger, lemon juice, mango chutney, and half the yogurt. Blitz until super smooth, then stir in the remaining yogurt. Season to perfection and pour over a big platter. Pile the roasted cauliflower and pineapple mixture on top of the dressing, slice the chile and scatter over, and sprinkle with the cilantro leaves. Serve with warm chapatis for dipping.